London - 12 August, 2012: An Indian-origin girl student in the UK has raised over 6,400 pounds by organising a '5K walk' for the world's largest NGO-run school meal programme which provides food for 1.3 million children daily in India. 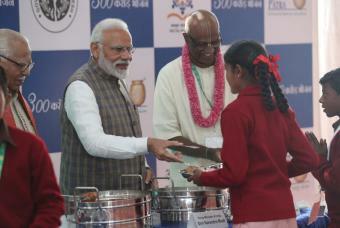 Sabina Ranger, a second year university student organised the '5K walk' for The Akshaya Patra Foundation, an NGO in India that provides food for school children across 9 states and 19 locations. Though her aim was to raise 3,000 pounds, Ranger was able to raise over 6,400 pounds, enough to feed 640 children for a whole year. The walk took place on 5th August, the same day that The Akshaya Patra foundation fed its billionth meal. Ranger made T-shirts with a picture of school children eating meals given by the foundation and with the NGO's logo for the walkers to wear. She was joined in by many neighbours and friends, besides her family and Dipika Khaitan, the president of The Akshaya Patra Foundation UK.